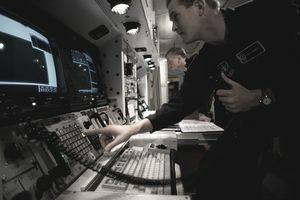 In the Air Force, Cyber Transport personnel are tasked with managing all manner of computer network hardware and communications equipment. This job is categorized as Air Force Specialty Code (AFSC) 3D1X2 and could be stationed at just about any Air Force base. This role has grown in importance since it was first established, with cyber security attacks growing more sophisticated on a regular basis. It's up to these airmen to protect the Air Force from potential cyber threats. These Airmen are like the IT specialists of the Air Force. They provide mission-critical voice, data, and video services, deploy and operate expeditionary communications systems, and monitor the performance of systems and circuits. They're also responsible for testing and troubleshooting network systems equipment and circuits. This may include IP detection systems, which identify cybersecurity breaches, as well as cryptographic equipment. Airmen are expected to have some basic knowledge of electronics and network principles before enlisting in this job. Even better: if you have some experience installing voice, data, and video network infrastructure. You need a composite score of at least 70 in the Electronics (E) aptitude qualification area of the Armed Services Vocational Aptitude Battery (ASVAB) tests. Since you're dealing with highly sensitive information in this role, you'll be subject to what's known as a single scope background investigation (SSBI), in order to obtain a top secret security clearance from the Department of Defense. In addition, recruits in this job need to have a high school diploma or its equivalent, be U.S. citizens and have a normal color vision (which means you can't be colorblind, even partially). You also have a state driver's license (because you may need to operate government vehicles). And you have to be between 17 and 39. After Airmen's week and the requisite 7.5 weeks of Air Force basic training, these airmen take the cyber transport systems specialist course at Keesler Air Force Base in Mississippi as their technical school requirement. This course lasts roughly 4.5 months or 136 days. After tech school, airmen in this job will report to their permanent duty assignment, where they are entered into 5-level (technician) upgrade training. Once you've completed this training and you've been certified as qualified to perform all the tasks of cyber transport specialists, you'll be upgraded to 5-skill level. This allows you to carry out your duties with minimal supervision. Those Airmen who attain the rank of staff sergeant will be entered into 7-level training, which will add supervisory and managerial tasks associated with this job. Once you've completed that training you may be put into a position of shift leader or flight superintendent. Upon promotion to the rank of senior master sergeant, personnel converts to AFSC 3D190, Cyber Operations Superintendent. These Airmen provide direct supervision and management to personnel in AFSCs 3D1X1, 3D1X2, 3D1X3, 3D1X4, 3D1X5, 3D1X6, and 3D0X7. A 9-level can expect to fill positions such as flight chief, superintendent, and various staff non-commissioned officer-in-charge jobs. What Does an Air Force Flight Engineer Do?